This was the last wish of Kit Hudson, a remarkable academic who translated the fabled Aksum scrolls to reveal an incredible adventure story known as The Seventh Season. 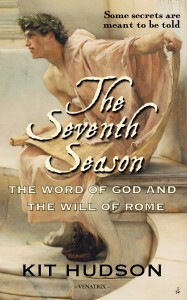 Narrated by a young man who worked for one of the Apostles, The Seventh Season offers a dramatic eyewitness account of the birth of Christianity. Written at a time when resistance movements against Roman occupation were reaching their height in Palestine and Greece, The Seventh Season depicts the epic struggle between the Roman Empire and those who wished to bring about its downfall. When The Seventh Season was originally published in 1965, attempts were made to destroy all copies of the book and Kit Hudson was forced into hiding. Someone, somewhere, saw something deeply heretical in the text and made sure this history of the early church remained out of view. Kit Hudson was a distant relative of mine and I have built this website – and republished The Seventh Season – to honour Kit’s final wish. It is my hope that this website encourages new readers to pick up a copy, as well as answer many of the questions people have about the book. Please check in regularly with the blog for the latest findings on Kit, the 1965 scandal and my quest to locate the Aksum scrolls. And please join the mailing list so I can send you exclusive letters from Kit, as well as some early drafts of his translation work on the Aksum scrolls. And please do contact me with any memories or information about Kit, the 1965 edition, the Abyssinian expedition or the Aksum scrolls.